A couple of weeks ago, I wrote about how we need to change the way we think about conversions in the article "Everyone Measures Conversions the Wrong Way. Let's Fix That!". In that article, I talked about the importance of lifetime value, mostly from the perspective of analytics and how you measure it. But what about the strategic element of it? If you are a publisher, how exactly do you build up this all important lifetime value? Or, in other words, what is the path to lifetime value? This is the topic for my latest Plus report. In this report, I will take you from the early stages of just getting a view all the way to the end, where you turn those views into a lifetime audience. Nieman Lab published a very interesting article about publishers using Kickstarter to get funding. 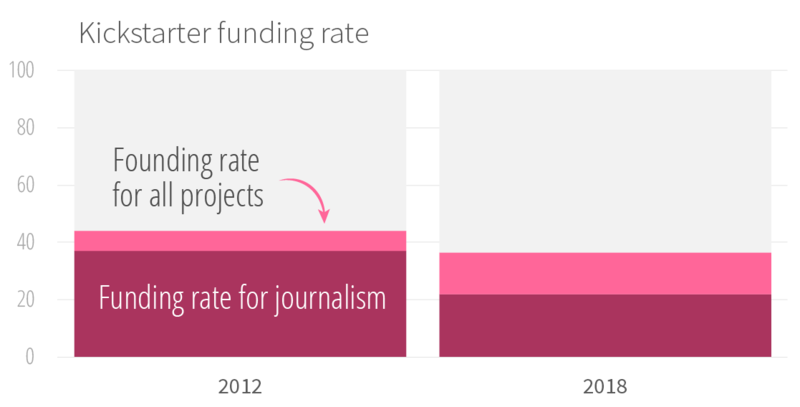 In it, we learn that it has been a very good year for new journalistic Kickstarter projects (which is great), but we also learn that journalism has a very low funding rate, which is less great. And I want to talk a little bit about this. First of all, if you were to ask me if you should try to get funded on Kickstarter, my answer is always no. As a publisher, your focus should always be on building up momentum, which Kickstarter is not very good at. So, if you are looking for funding, trying to build up a more direct relationship with your readers is a better option. On top of this, there are a number of issues with using outside platforms to make contact with your most valuable audience. There are problems with how you control the data, how you communicate with them, and other things like that ... and this is not just true for Kickstarter, but all the other platforms, including Patreon. If you are monetized via Patreon, creating exclusive content just for your patrons usually means publishing on their platform instead of your own site ... which is not what you want to do with your most valuable audience. There are obviously some upsides to using these platforms. Most of all, they lower the barrier to entry, making it potentially easier for a new journalistic startup to get off the ground. But be mindful of the challenges you might face having to communicate with your most valuable audience outside your primary place of journalism. Anyway, that's not really what I wanted to talk about. I wanted to talk about the funding rate. In the article from Nieman Lab we learn that in 2012 (a long time ago), the average funding rate was 37% for all journalism projects. This is then compared to an average of 44% funding rate for all types of projects combined. Then in 2018, the rate of funding had dropped. Today, only 21.8% of all journalism projects get funded, out of an average of 36.5%. Keep in mind that when we say 'funded', a staggering 53% of all projects received only between $1,000 and $9,999, thus 'funded' is a very relative term. So, overall, the novelty of Kickstarter is down, but even more so for journalism startups. This is a problem that I come across quite often. We are not very good at defining a unique product for people to support. Let me give you an example. I'm not going to mention the name of this journalism startup, but I recently came across a group of editors/journalists who got tired of working for a big publisher and decided that they would create their own newspaper. First of all, I think it's great if, as a journalist, you are so tired of how things are going that you try to start your own media company to fix it. This is something that wasn't possible in the old days, but with the internet, it's a wonderful thing to see. We are going to cover politics, crime, local stuff, culture and other things that are important to you. That's the same thing everyone else is doing. They have changed nothing. It's still completely random. The editorial focus is 'whatever news happens that day', and the definition of relevancy is still just ¯\_(ツ)_/¯. So when they go on Kickstarter (or any other platform), they might get a few people to support them. But as a business model they have just recreated all the problems they already had. This is one of the key reasons why journalism projects have such a low funding rate. They are not changing the product. It's like if a new fashion company presented itself by saying: "We have this new idea for a fashion brand. We are going to make t-shirts, jeans, shirts and jackets". There is also the problem that many news startups go into the market as if people don't have news. So, they will say something like: "We will provide you with the news" ... apparently thinking that people don't already have that. It's the weirdest thing ever. The problem we have today is 'news fatigue', in that people are flooded with news from too many sources (in a conflicting and unclear way), not just from the hundreds of news sources they can get to online, but also from exposure to news-like content from thousands of other channels (and I don't mean fake news here, I mean news that you just hear about every day because of how connected we are). So, why would you think that the problem you have to solve is to give people the news? On top of this we have the problem with local news. Many journalistic Kickstarter/Patreon projects are based on hyperlocal journalism, and a few of them are really nice. And what most of them are saying is that all the big newspapers are moving away from local news (and becoming more nationally or internationally focused), so there is now a need for local newspapers to 'fill the gap'. There is some truth to that, but often not in the way you think. I have talked about this a million times before. Being 'local' used to be defined geographically, where you would create a package with a little bit of everything within a specific area (exactly like the big newspapers, but locally). But today, people define local around the issues that are relevant just for them. And while some of these issues are indeed geographically defined, much of our attention isn't. So, when you create a new hyperlocal newspaper, your local focus might indeed be better than what the big newspapers provide, but you are not necessarily defining local in a way that is relevant to people. The outcome of this is what we see with the funding rate of journalism on sites like Kickstarter, where only 21.8% of the projects ever get funded, and where the amount of money being raised is often extremely low. In fact, compared to other projects, almost all journalism projects are basically a failure. If you can create a board game within a very niche audience that raises $8 million , it's kind of sad to see that an otherwise great journalism project like the Block Club Chicago only managed to get $183,720. It tells us a lot about the saturation of the market, and how we are not providing something unique and valuable to people. And this doesn't just apply to small startups. It also applies to big publishers. So... realize that a big part of the challenge we face today is based on how we define what a newspaper is, and take some time to wonder if there is a better way to define this.